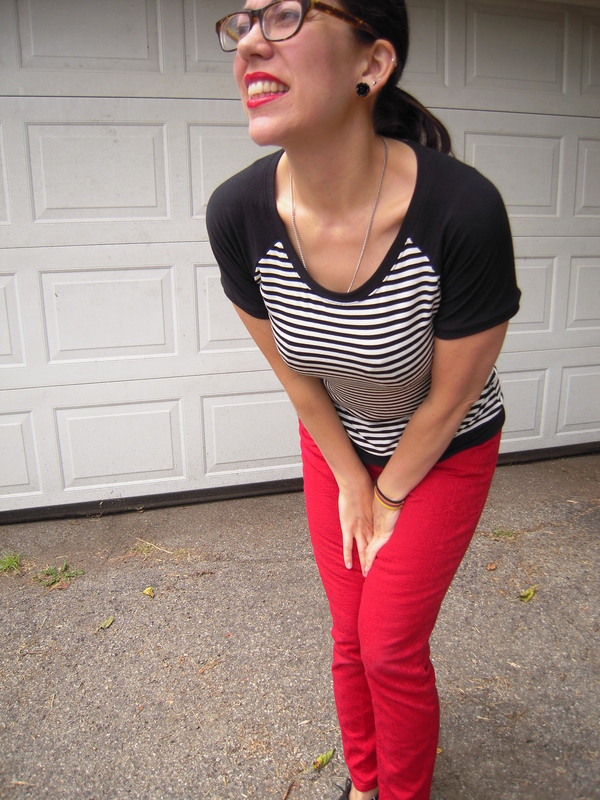 Pinup girl stripe Trifecta Top FTW! While browsing Instagram, I came across a picture posted by Pinup Girl Clothing that made me stop in my tracks! 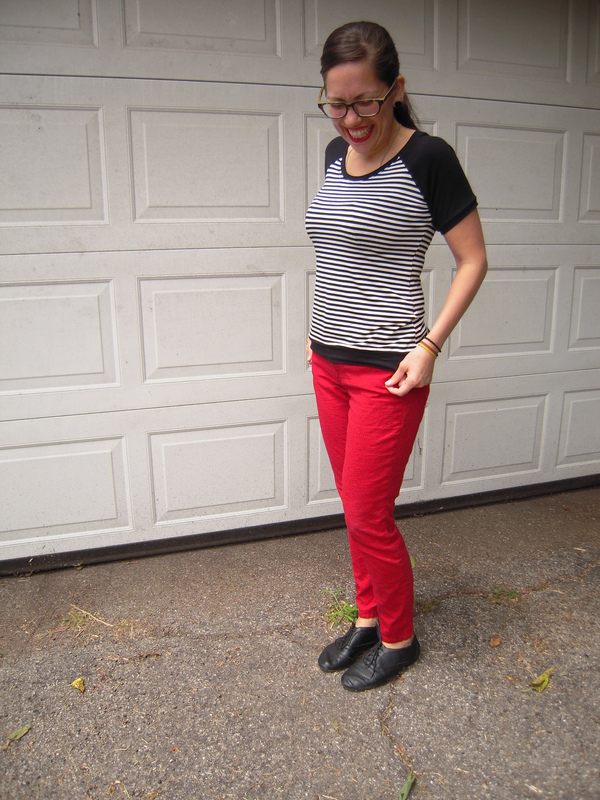 After seeing this top with the red pants, I knew I wanted to make a stripey top and what better time than now to try Kitschy Coo’s Trifecta Top pattern. I made the size 3 with no alterations. Only thing I didn’t follow was the sleeve length. There’s a cut line if you’re doing the cap sleeves with arm bands and a line lower for hemming the sleeve. I cut at the hemming line but still added the arm bands. 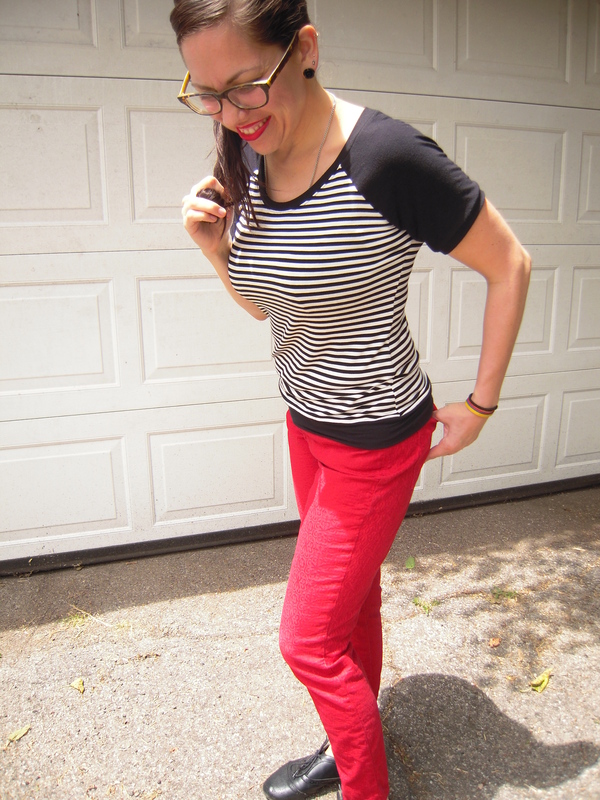 Once I started cutting, it was a bit late, and I wasn’t about to start matching stripes on a raglan…so, really, my top isn’t an exact copy as you’ll see but I totally got inspired by PUG. What’s on the ground that I keep looking at? Geez, Breton! Apparently it’s funny so I’m going to guess: squirrel? The jerseys I used for this top are so super soft they make me want to curl up inside and take a nap. Sorry, I don’t remember where I got the stripe. It might have been from The French Seam here in town- which would make sense because it’s seriously delectable. The black rayon jersey is from Fabric Mart. Pants are from Banana Republic. Lip pretty is from Obsessive Compulsive Cosmetics. A lip stain called Stalker. Steph from Cake Patterns got me hooked on this brand. It’s amazing, feels great, doesn’t cake and I don’t have to reapply even during work. I love the Trifecta top pattern. The long sleeved version is great too. Never too many stripes. I’ll help you test this theory. Perfect success. I’m not one for mesh, but would def read about such an adventure. Thank you. I won’t disappoint. I love this! 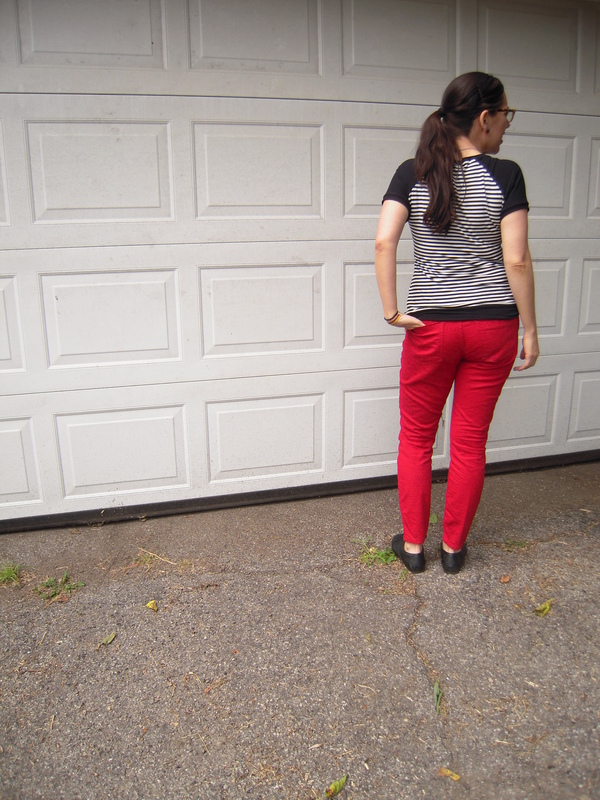 Paired with the red pants it is divine! 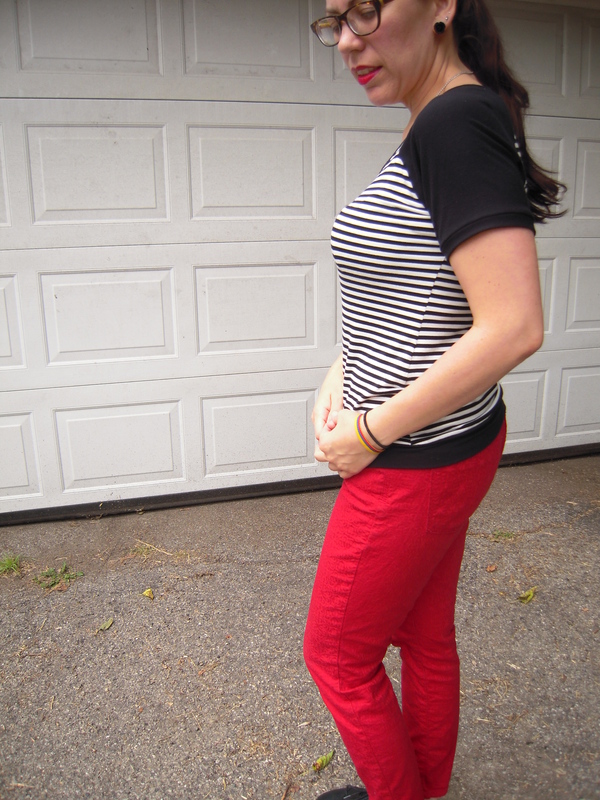 Stripes and red are the perfect match! Yes! I would love to see this in Mesh!